Scanning the shelves in Michaels with a 55% coupon in hand, I looked around for something I could make an easy, do-it-yourself banner with. My eyes landed on a pad of burlap card stock. There were 24 individual sheets of burlap, backed with cardboard. ​Being the worst at cutting straight lines, I figured that individual sheets would save a lot of frustration. ​And, I had been looking for an opportunity to work with burlap. 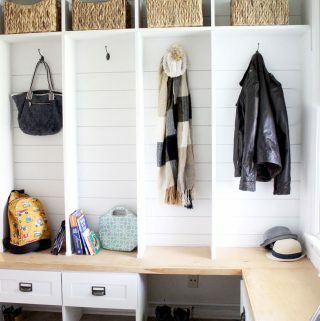 People love burlap – and it’s everywhere. I’ve seen mason jars wrapped in burlap, curtains made from burlap, flowers wrapped in burlap, and entire weddings crafted from burlap. I even worked with a teacher who covered all of her bulletin boards in burlap. I had never crafted with this material before – but I do agree that burlap brings a natural warmth and texture – so I was excited to check it out. 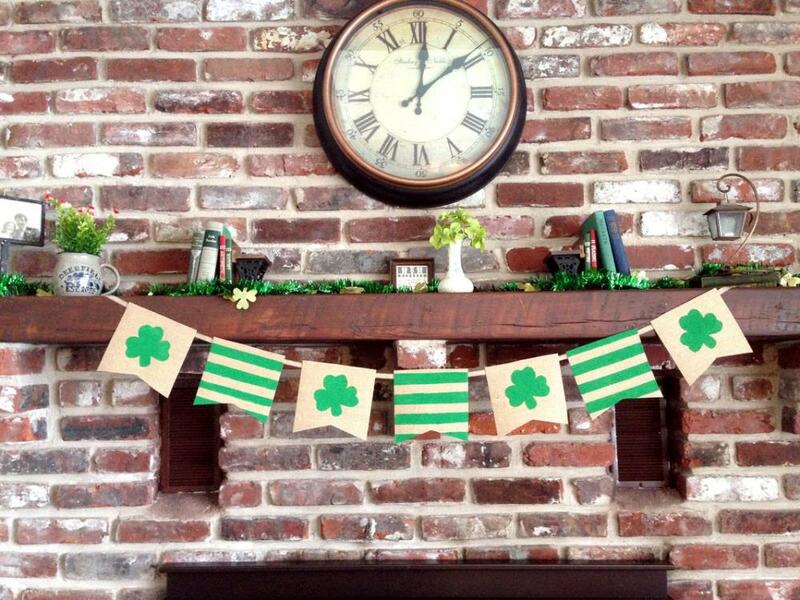 So, I got started on my project – which was to teach myself how to make a burlap banner for St. Patrick’s Day from homemade stencils and burlap. Acrylic paint – I used the two pictured below, mixed together. 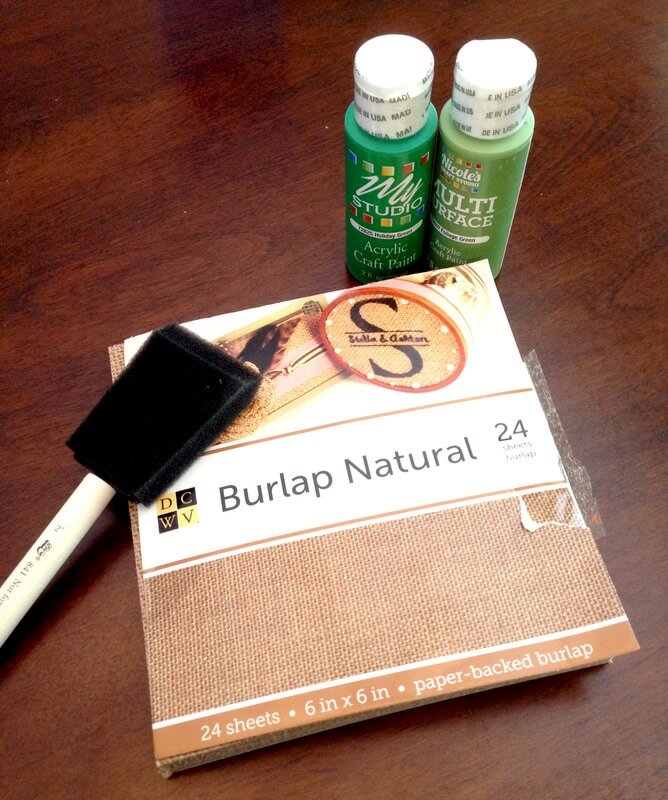 Burlap – I loved using the cardboard backed sheets from Michaels. Here’s a similar one. Scissors – A good pair makes a big difference! 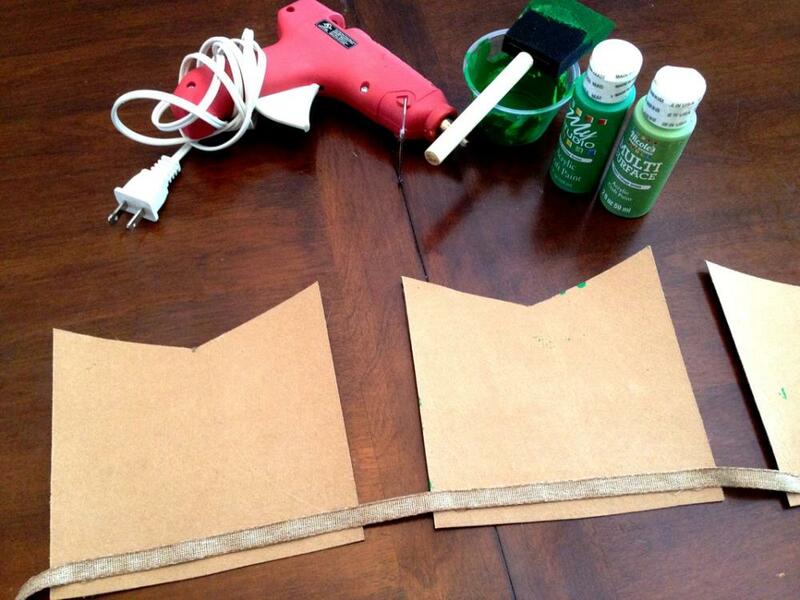 The instructions for making this banner are quite simple: preparing the burlap material, making the stencil, painting the burlap, and connecting the burlap pieces. First, I simply made a triangular cut on the bottom of each sheet. The burlap was easy to cut into with the cardboard backing. 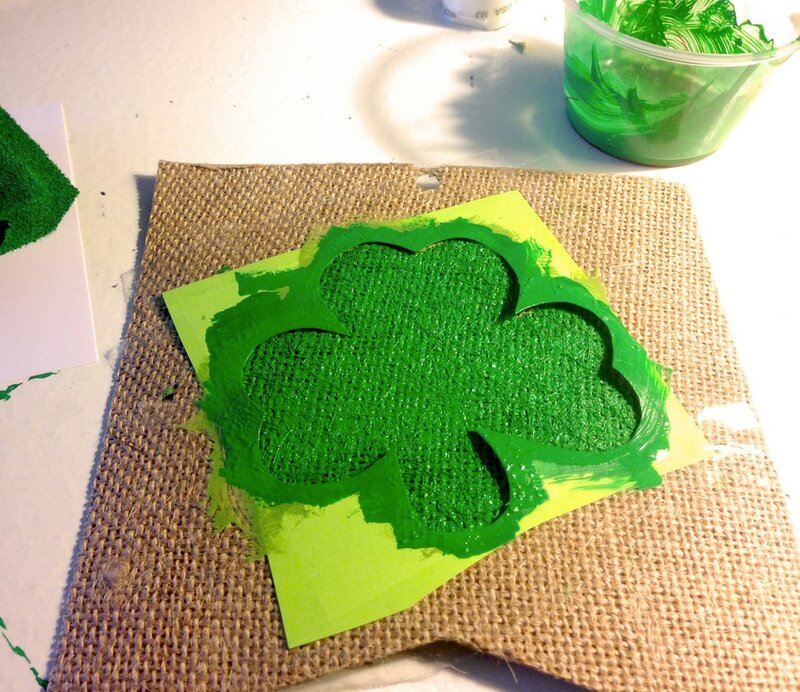 Then, I traced a shamrock onto card stock – and carefully cut out just the middle. This made the shamrock into a stencil. 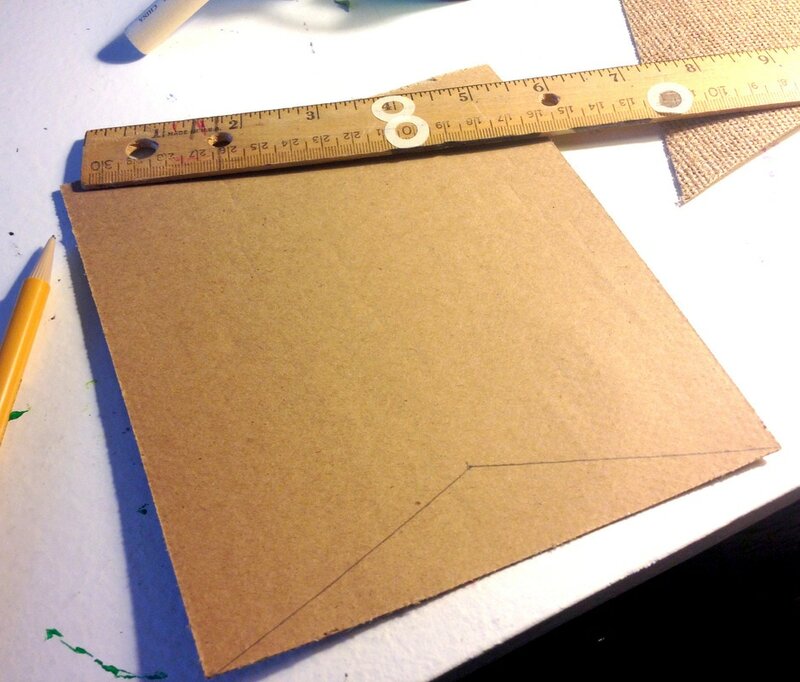 I then taped it onto the burlap, making the cardstock as flat as possible. Next, I used the foam brush (probably should have used a 1/2 inch foam brush – but I like to use what I have) to dab on the green paint. Be careful to keep your brush straight, so it doesn’t slip under the stencil. As a side note, I tried this using a regular paint brush also. While it worked, it took a lot longer and didn’t give a consistent coat. You can definitely use a regular paint brush, but the foam brush did a nicer job. For the stripes, I used strips of scotch tape to create the lines. 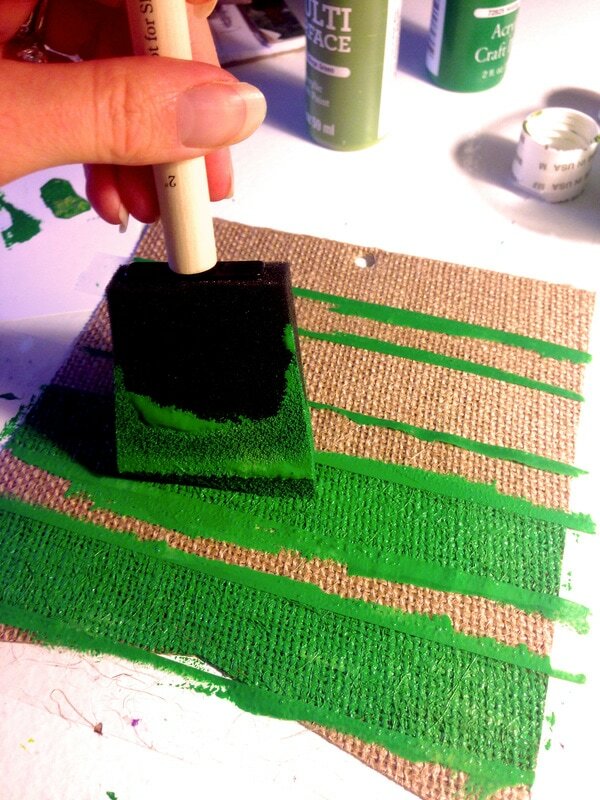 Then, I just dabbed on the green paint onto the burlap. Immediately after, I removed the tape and moved on to the next sheet. Pictured below is the edge of my desk, with my stencil and scotch tape strips. Rather than use a ridiculous amount of tape, I used the same four strips over and over, and I hung them here while not in use. 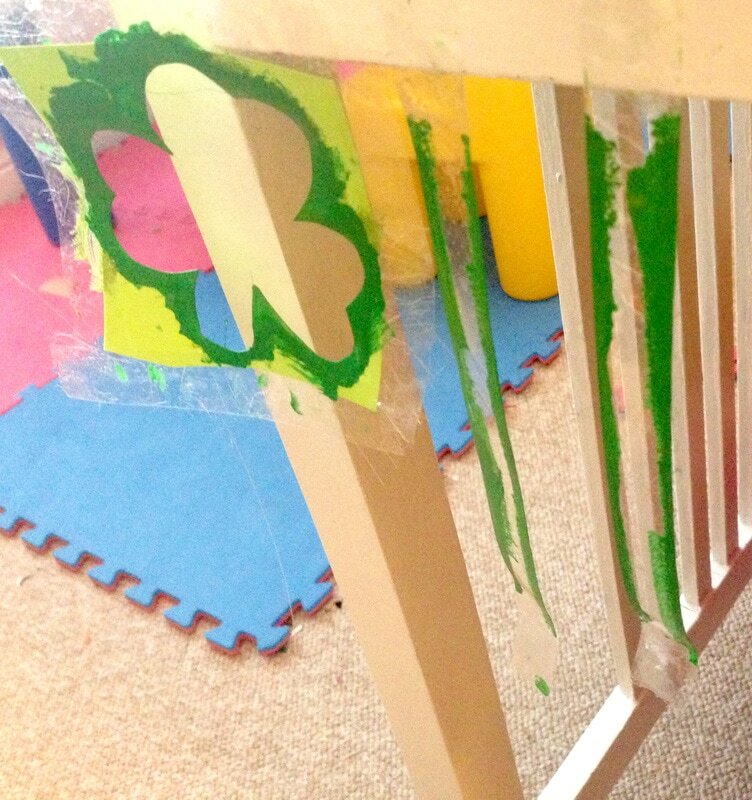 I also went back and forth with painting a shamrock, then stripes – this gave the stencils/tape a little dry time before more use. Here are two of the burlap pennants, in the process of drying. Both the card stock stencil and the tape worked really well. The paint looked very neat, and I had a nice, clean outline on every pennant. After the individual pennants were dry (only took a few minutes), I used burlap ribbon and hot glue to connect them into a banner. I found the burlap ribbon at Michaels during a 70% off sale prior to the holidays. I bought loads of ribbon then, without a use for any of it. 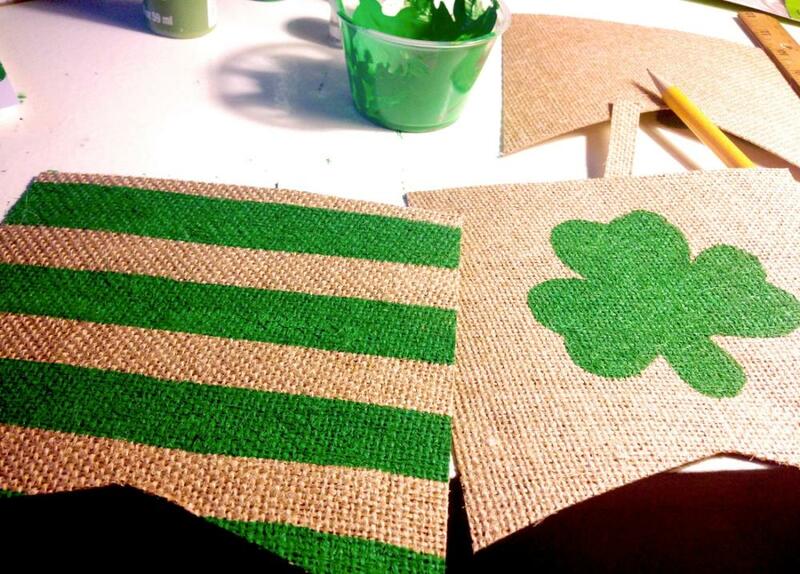 So, I lined up my stripes and shamrocks in the order I liked and flipped them over for gluing. Then, I used my handy glue gun to do two drops of glue on either side of every pennant. 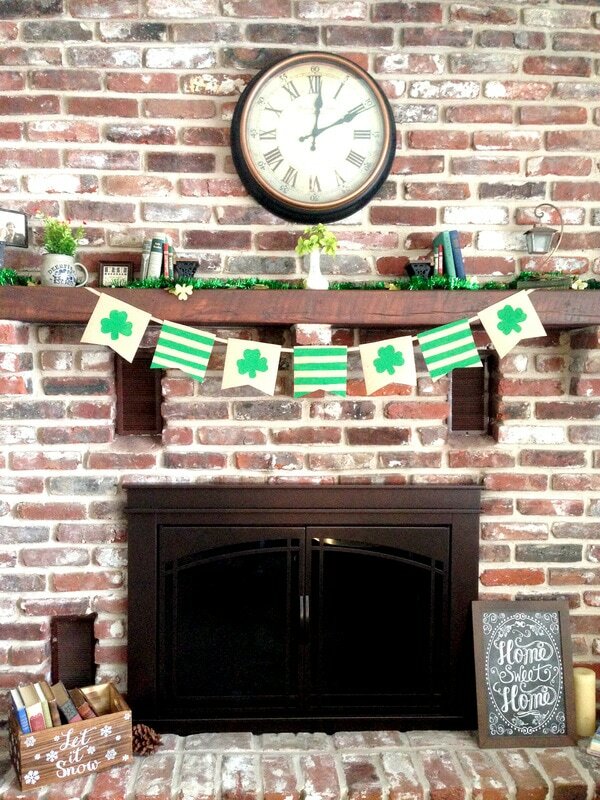 I LOVED the way the sign turned out – it was so festive and added much more to our mantel than some of the store-bought St. Patrick’s Day decorations. I don’t know which shocked me more – the fact that I made the banner for less than $5 or that I made it in less than an hour. I love this banner – Thanks for sharing on the Pleasures of the NW’s DIY Party! Thanks Helen! I love the way it turned out – especially for my first attempt at a burlap banner. I didn’t realize it was so easy to make a banner like this!! I love the rustic feel that it brings 🙂 Great job! Found you at Silver Pennies Sunday. That looks so festive and perfect for St Patrick’s Day celebrations. Thanks for sharing your idea with us at #OvertheMoon Link Party. I’ve pinned and shared. So easy to make! And it looks so nice. Love! I really want to make one for Easter! With this great tutorial, I might just do that! How cute and festive is this! Thanks so much for linking at #iDIYedthat. Hope to see you again next week. That turned out so cute! XOXO Stopping by from Tuesday Talk! Thanks Jess 🙂 We love sharing there! Cute banner! I’m a sucker for anything with stripes. 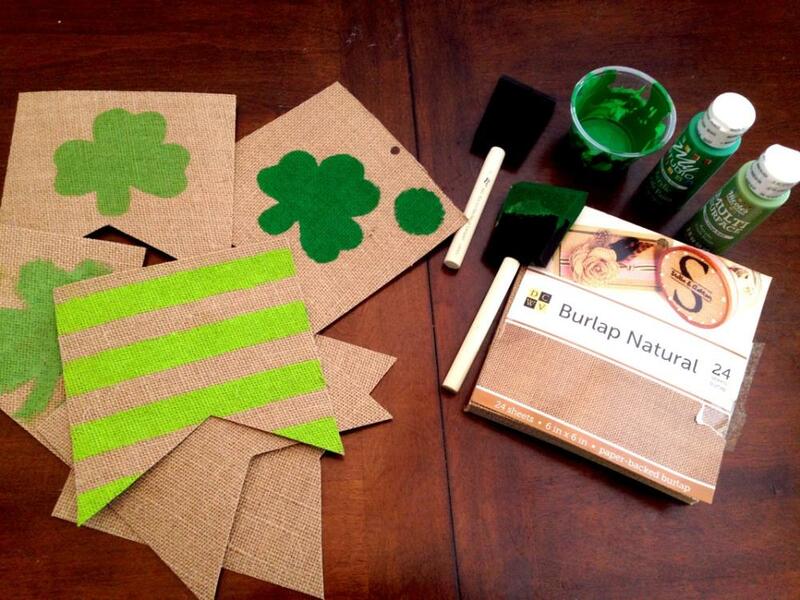 I haven’t done much with burlap either but I’ll have to give burlap a second chance! Visiting from Wine’d Down Wednesday party. Thanks, Victoria! I love stripes too – and they were so easy! I’ve never worked with just the burlap fabric – but this was burlap backed with cardboard. It was super easy to work with and already cut to size (and only cost a few dollars). I never thought of using paper for banners like this! That’s such a creative idea and would definitely make it faster to create banners. Cutting straight lines is not my strong suit either and I will be on the lookout for these. Your banner came out perfect and I’ll make sure I have my coupon when I buy these. Thank you for sharing with us this week at Celebrate Your Story, have a great week. Thanks so much, Sandra 🙂 Yes, they only cost around $5, but the coupon cut it down even more. And I love a good deal! The burlap sheets cut-to-size definitely made for a quick DIY banner:) Have a great week! Thanks so much Crystal! I can’t over how easy it was 🙂 Have a great week! It turned out so cute! I never would have thought to make a banner out of it! Thanks so much, Tracy! I’m always looking for cute, cost-effective decorations – and all I could find were beads and hats – so I set out to make my own 🙂 It was super easy! Your banner idea looks great… and it could be tailored to fit many other purposes also. Good idea. Love this banner! Thanks for sharing at To Grandma’s House We Go link party. Adorable. Great tutorial. 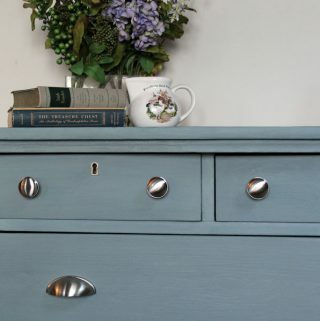 Thank you for sharing with us at Vintage Charm. Thanks Sharon! I love the way it turned out – so much that I just did a bunny one:) have a great week! I love this burlap banner! 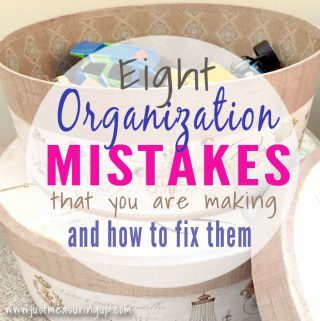 I will have to remember this for next year….or any other time I need to make a banner. I had no idea they sold burlap card stock. Thanks so much for sharing at the Friday at the Fire Station link-up! I hope to see you back soon! That is a sweet looking banner. I didn’t know what burlap was before reading this either. Thanks for sharing. It looks wonderful, and so easy to make too. Thank you for sharing the tutorial at The Really Crafty Link Party this week. Pinned! Thanks Teresa:) it was an easy DIY! Very cute! I totally agree that burlap buntings are a great neutral choice for special occasions. I bought a couple pre-made buntings for about $1-$3 each and use them as accents all the time. Sometimes I even layer printable buntings on top for a more customized look. Though, I love the look of your painted bunting. The texture on top of texture is perfect! Thanks so much for sharing at the #happynowlinkup! Thanks Leslie! Wow your premise ones sound awesome. Have a lovely week! 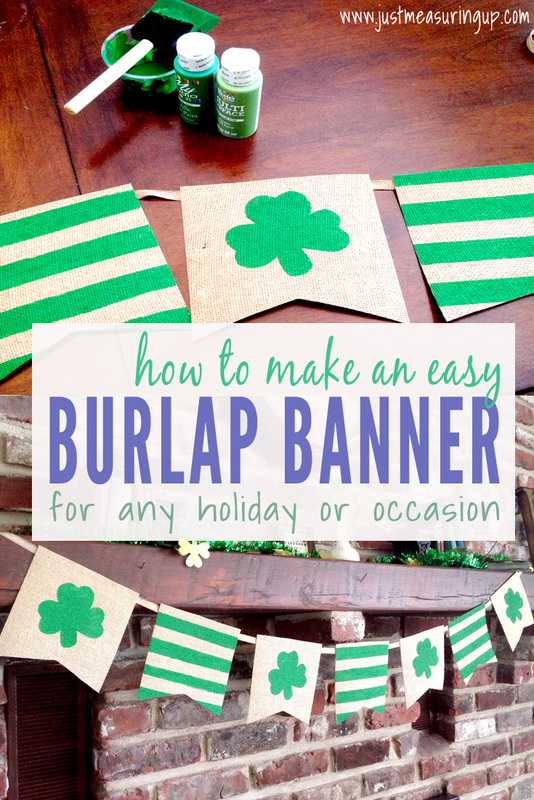 So festive and burlap banners are timeless! This post will be featured at the new Merry Monday party. Thanks for sharing. 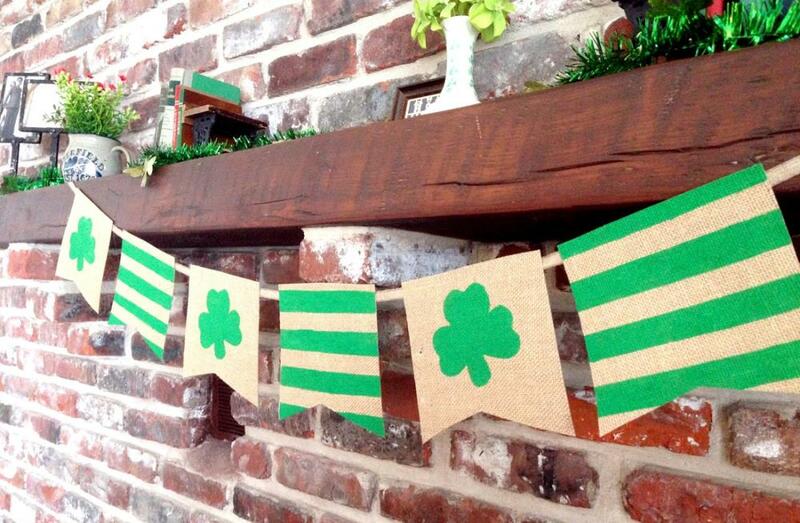 Burlap banners are so fun. This turned out darling! Thanks for sharing with SYC. Quick & inexpensive crafts like this are my favorite! Thanks for sharing with our Merry Monday party – I’ll be featuring your banner at our upcoming party. Hope you’ll stop by next week and link up again. Me too – makes me feel so productive! Thanks so much for the feature!! I think when patience was handed out you were given mine because I have none! This is a great idea. Thanks for sharing it with #TriumphantTales. Do come back next week. Aww that’s so sweet, Jaki! Thanks for sharing this on MM. Pinned and will be including this in a St. Patrick’s Day roundup. Great project! Thanks for sharing in the To Grandma’s House We Go DIY, Crafts, Recipes and more link party! This is just super, super cute! Thanks for sharing your projects with us at the Homestead Blog Hop!